PROCYCLES RACE RIDERS SCORE AT NSW OFF-ROAD TITLES. You are here: Home › PROCYCLES RACE RIDERS SCORE AT NSW OFF-ROAD TITLES. 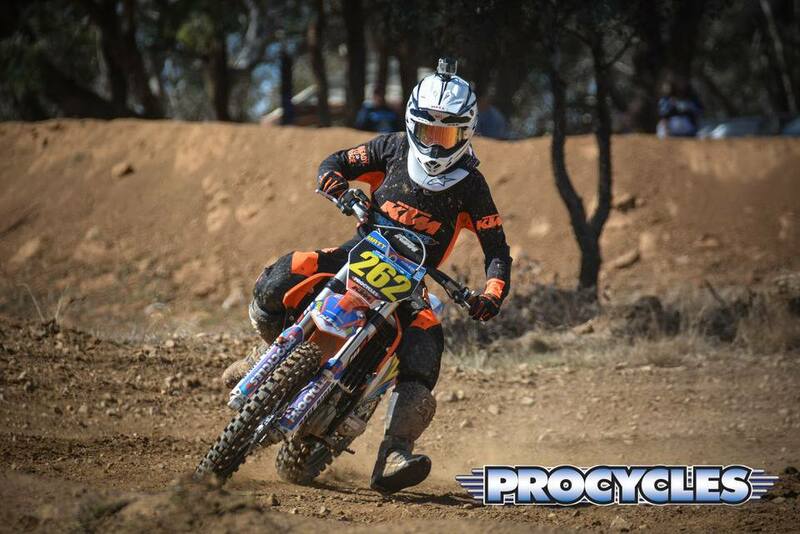 Over the past 6 months, Procycles teammates Matt Parker-Doney #162 and his younger brother Will #693 have been contesting their debut season of the NSW Junior Off-Road Championships. Rounds of the championship have consisted of a series of mixed style events including 2-hour endurance races in thick dust and blaring heat, sprints in the alpine region in the aching cold and Enduro X, dead engine starts over challenging timed obstacle courses. The Procycles KTM’s have run perfectly all season allowing both Matt and Will to concentrate on scoring overall championship points. Unfortunately for Matt, a detrimental shoulder injury precluded him from contesting two rounds and a nasty virus saw him sit out the penultimate rounds held in the freezing temperatures of Portland last month. Whilst narrowly missing out on a podium at the end of the season, his results did not go unrecognised when he was awarded with a True Spirit and Outstanding Achievement Award for his rookie season in the J4 class 13-U16 125-250cc, at the weekends gala presentation night. Will contested various rounds throughout the season on both his KTM 65SX in the JM class and KTM 85SX bike in the J1 class. He was never very far from the front of the field at all events often trading stage wins and overall podiums at each round with only one other rider. 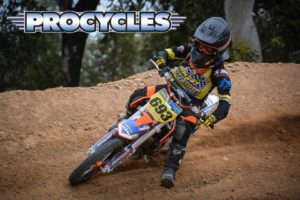 At the close of his rookie season, Will was crowned the second best Junior Off-Road rider in NSW with a second place in the State title. 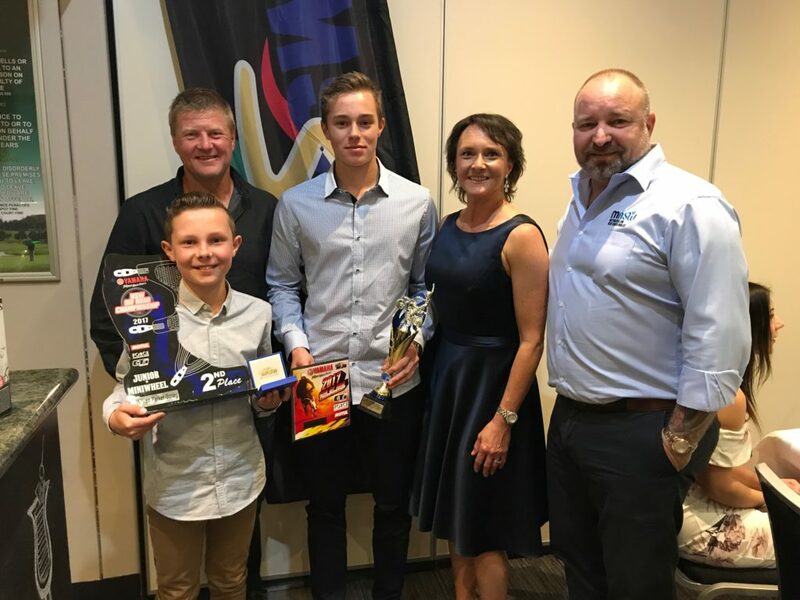 [PIC] Matt and Will at the 2017 NSW Off-road Championship presentation night pictured with Melanie Parker-Doney – Mum and Owner MPSM Motorsport, Brett Kenny – owner of Holeshot Graphics and Dave Cook – CEO of Motorcycling NSW. Without the constant hard work and impeccable service work carried out by Anthony and his workshop team at the Procycles Hornsby store, Matt and Will would not be able to achieve all their results. Both the Procycles Race Riders would like to thank all their sponsors for contributing to their success in 2017. Without their support and of course the family’s commitment, going racing would be impossible. Matthew and William are part of the Procycles Race Riders team supported by MPSM Motorsport, Holeshot Graphics and My Action Images. In addition, Matthew is also supported by Plus Fitness 24/7 Gyms.